Traveling through rural Laos is quite an exhilarating experience. Driving through small quiet roads and passing rural villages you will certainly feel like you have stepped back in time. Things haven’t changed much in rural Laos; a country that has kept a similar culture and tradition for many hundreds of years. You are likely to pass ethnic villages each with their own unique traditions. One thing to keep an eye out for is the Dok Champa flower! 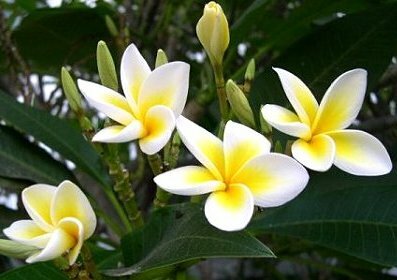 Its botanic name is the Plumeria or better known by its common name the frangipani. In Laos Dok actually means flower and Champa is the Laos name of the frangipani in Laos. The trees are often planted around the country especially in gardens and monasteries. It is used for decoration in ceremonies or made into garland to welcome guests. One traditional ceremony that you will see the Dok Champa flower at is a Baci ceremony. This is a traditional ceremony held in local communities to wish a person good luck on their travels or for taking a new direction in life. That may be getting married, starting a new school, the birth of a child or recovering from an illness. The ceremony is performed by a village elder that has previous experience as a monk. Look out for the Dok Champa in a prepared flower tray which is placed at centrally in the room for people to gather round. There will also likely be young ladies performing a traditional dance in traditional dress with a Dok Champa flower in their hair. During the Baci ceremony, a white thread of silk or cotton is tied on the right hand wrist of the individual who the Baci is being held for. The string is blessed by the people attending the baci before it is tied onto the individual. The thread is worn by an individual normally for a minimum of three days before it is removed. Another common practice is to use the name Dok Champa when starting a new venture or naming a place. So when traveling through Laos you will often see a variety of restaurants, guesthouse, hotels and even traditional massage establishments with the name Dok Champa associated with them. This is common practice for good luck. So keep an eye out for this wonderful flower whether on a long drive on mountain roads or just strolling through one of the lovely towns or villages across Laos including the world heritage site of Luang Prabang or by one of the magnificent waterfalls.